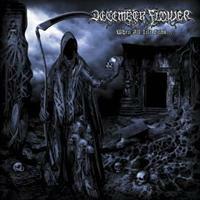 German melodic death metal band DECEMBER FLOWER debuts with this totally own handled affair. Real melodic death metal and no lame wannabes is promised. It better be, since they aim for fans of UNANIMATED, DISMEMBER and DARK TRANQUILITY! The opener “Invasion (Intro)” feels more like a young IRON MAIDEN than a band with a barbed wire logo. It seems melodic death metal is interpreted as heavy metal death by theses young Germans. Works ok for the most part. But the decidedly old school “As Darkness Reigns” rises the bar a bit, as does the utterly melodic “Blood Has to Be Shed”, with a sound picture of groovy clarity. Their intro, outro and instrumental (“Dying Sun”) are the most surprising tracks. The guitar work is more than decent, displaying technique that is beyond most death metal bands. But the downsides arrive when they opt for more brutality, as in the hammering and boring “Despise Your Life”, in which even the vocals seem to deteriorate. Well, well, this lot sure has the years going for them, and there are some really promising elements. With some structuring and a bit of outside direction in the studio this could end up a favorite for years to come.